Reading food labels is not the most entertaining thing in the world. In fact, you would think that if you read one, then you read them all. Quite often people will read a food label looking for just one measurement. This might be Calories, Carbohydrates, or Fats. Either way, it is important to learn how to read a food label as a whole so you can better understand what you are putting into your body. This post is a quick, crash course on how to read a food label. The goal is to help you understand why you might be fighting a struggle that you keep on losing and don’t know why. Food labels contain product-specific information such as serving size, calories, and nutrient information. 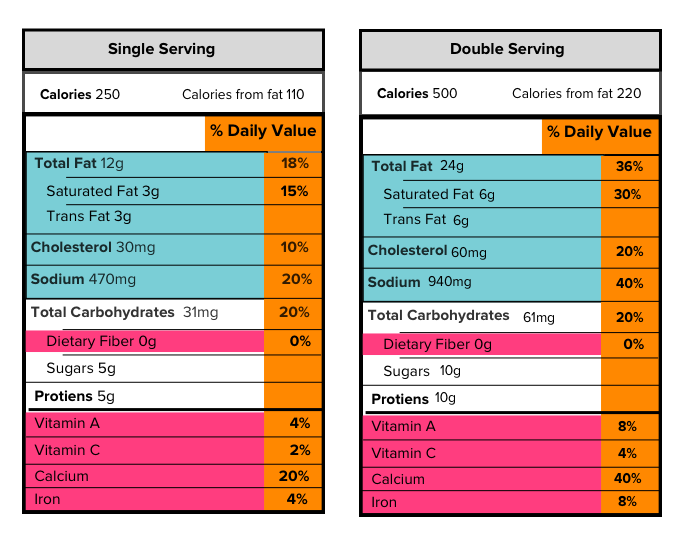 The information can vary with each food product, so I have broken down a food label to help guide you through each section. At the top of the food label #1-4 and #6, we will be focusing on the nutritional value of the product. 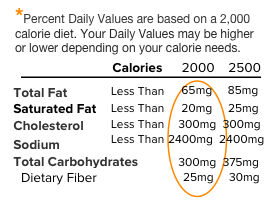 While at the bottom (#5) we will look at the footnote that contains the Daily Values (DVs) nutrition for 2,000 and 2,500 calorie diets. The following Nutrition Facts label has been colored coded in sections to help you identify the areas that will be explained in detail. Unfortunately food labels don’t come with these pretty colors. When looking at a Nutrition Facts label the first place you want to start is the serving size. This will tell you the serving size and the number of servings in the package. I can’t tell you how many times I’ve been burned by eating a whole pack of Oreos only to find out that I just ate 37 servings. Serving sizes are pretty standardized to make it easier to compare similar foods. All serving sizes are broken down by either cups or pieces, followed by the metric amount, e.g., the number of grams. The size of the serving on the food label will influence the number of calories and nutrient listed on the top part of the label. When looking at the serving size you want to pay close attention to how many servings there are in the package. This means that 1 serving is equal to 1 cup. But wait, the label informs us that there are 2 servings in this package. So if you ate the whole package, you would be doubling your servings. 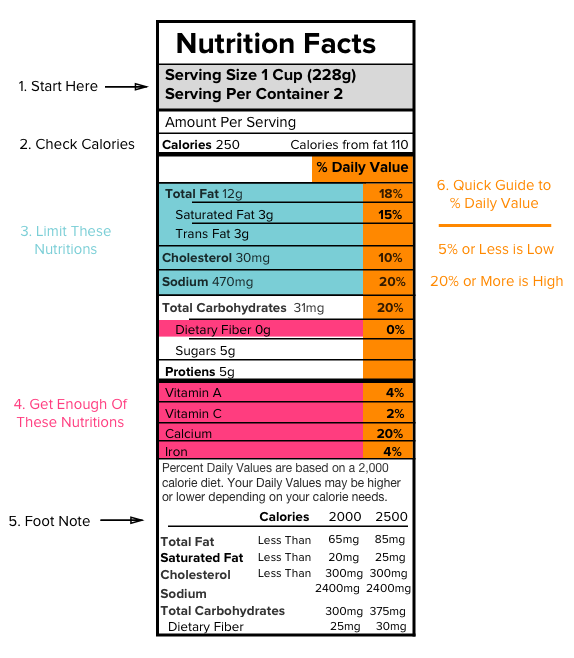 Below is an example of how serving sizes affect the calories and nutrition you are consuming. Notice how easy it is to think that you are eating something decently healthy when you consume the whole package. Little did you know that you ate twice the bad stuff than you were supposed to! Calories help us know how much energy we are getting from a single serving of food. Many of us are consuming more calories than needed without getting the recommended healthy nutrients we need in a day. The calorie section of the label can help you manage your weight whether you are looking gain, lose, or maintain. Remember, the number of servings you consume will determine the number of calories you are eating. The calories section shows us the total amount of calories per serving but also the total calories of fat per serving. In the example, there are 250 calories in one serving. Out of those 250 calories, 110 of them are nothing but fat, which means almost half the calories in a single serving come from fat. What if you ate the whole package content? Then, you would consume two servings or 500 calories, and 220 would come from fat. I know fat is a bad term, but there is nothing wrong with getting your calories from fat. Once your body stops getting its energy (calories) from carbohydrates, it resorts to burning fat instead. We all want to burn fat so don’t mistake calories as something that is always a bad metric. It’s totally dependent on everything else that comes in the food. 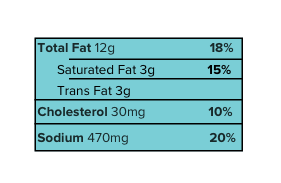 This section of the label shows us Total Fat, Saturated Fat, Cholesterol, and Sodium, with quantities and % daily values. These particular nutrients are the ones we typically like to consume too much of because they make food taste really, really, really good. But eating too much of these nutrients may increase your risk of heart disease or even high blood pressure. So when choosing products to eat make sure these nutrients are low. 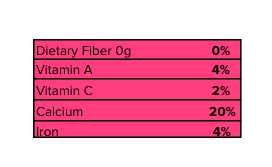 Label sections showing Dietary Fiber, Vitamin A, Vitamin C, Calcium, and Iron, with % daily values and quantity of dietary fiber. Most of us don’t get enough dietary fiber, vitamins, calcium, or iron. Getting enough of these nutrients can improve your overall health. A diet rich in fruits, vegetables, and dietary fiber are low in saturated fat and cholesterol and can reduce the risk of heart disease. Load up on these nutrients. I know they don’t do much in making food taste better, but at least they can help you live longer which gives you more opportunities to try more foods! Notice the * used before Percent Daily Value (%DV) on the bottom of the Nutrition Facts label. This tells you %DVs are based on a 2,000 calorie diet. This statement is on all food labels. The remaining information on the footnote may not be on all packages. If the full footnote does appear, it will always be the same no matter what the product is. Look at the amounts circled in orange in the footnote–these are the Daily Values (DV) for each nutrient listed. DVs in the footnote are based on a 2,000 or 2,500 calorie diet which are the recommended levels of your daily intakes. 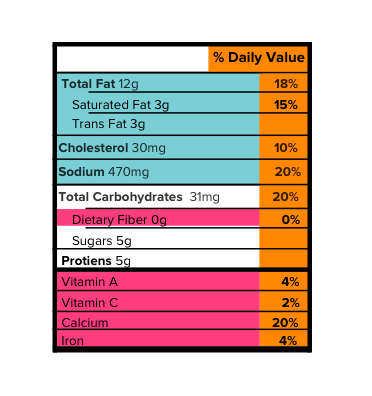 Let’s take a deeper look at the above sample and the amount of Total Fat in one serving. The Total Fat for this product is 18% of the Daily Value. 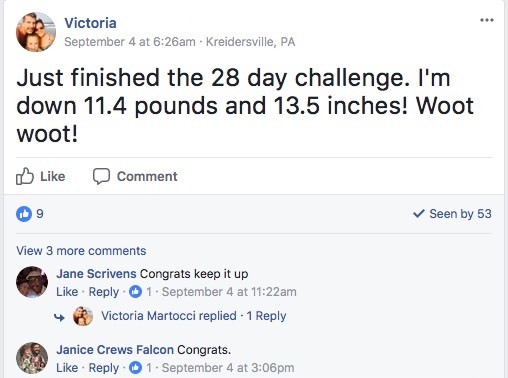 But does this 18% actually contribute to your fat limit of 100% DV? Well, 18%DV is below 20%DV so it’s not too high, but what if you ate the whole package? 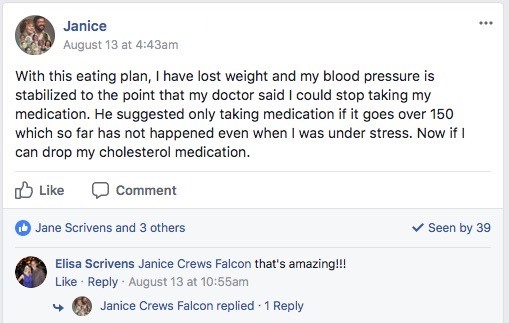 Well, you would double the total fat amount putting you at 36% from just one food, leaving you with 64% of your fat allowance for the rest of the day. As we all try to get fit and live healthier lives, we each have different requirements. Even though food labels are based on 2,000 calories diets, if you are working out, you will need much more than that. Remember, these are just the daily recommended values for a normal human being and none of us are normal. To better understand nutrition labels you need to better understand what your goals are. If you are looking to build muscle then Proteins is something you would be focusing on in nutrition labels. If you solely want to burn fat and get lean, you might pay more attention to Sugars in the Total Carbohydrates section. Sick all of the time? Check the Vitamins section to see if any of the foods you are eating is helping you out or do you need to pop a couple more Flintstones chewables? Understanding how to read nutrition labels makes it easy for you to make comparisons. You can compare one product or brand to a similar product. Just keep an eye on the serving size and make sure they are similar, especially the weight (e.g. gram, milligram, ounces) of each product. It’s easy to see which foods are higher or lower in nutrients and what would be a healthier choice for you. Too often people get caught up on what the food packaging says on the front (Fat-Free, Gluten-Free, Asteroid-Free) and don’t pay attention to the important details on the back. Learning how to properly read nutrition labels and choosing the right foods goes a long way to achieving the body and lifestyle that you want. It just takes a couple extra minutes of your time and it will all pay off later. We all want to build a healthy relationship with food and to do that we need to understand what it is made of. Eventually, you get to the point where you just remember what type of foods are holding you back and which ones are pushing you forward. 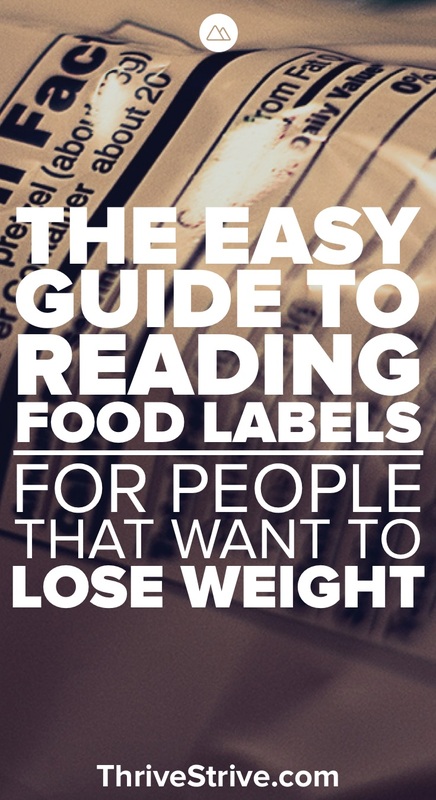 Enjoyed Understanding Food Labels: A Guide for People That Want to Lose Weight? Share it with your friends so they to can follow the Thrive/Strive journey.